Godspeed MAXX Coilovers are for the most indiscriminate customers. Featuring mono-tube shocks with electrode-plate finish to provide corrosion resistant property. 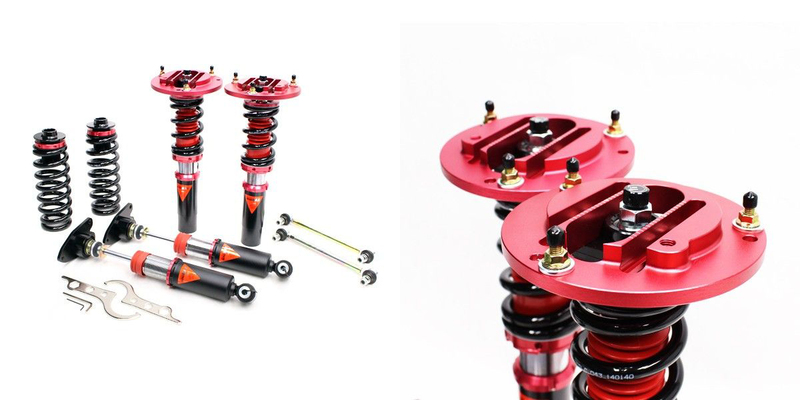 This coilover system is designed with performance in mind yet retains a good ride quality if you chose to use them on the street. 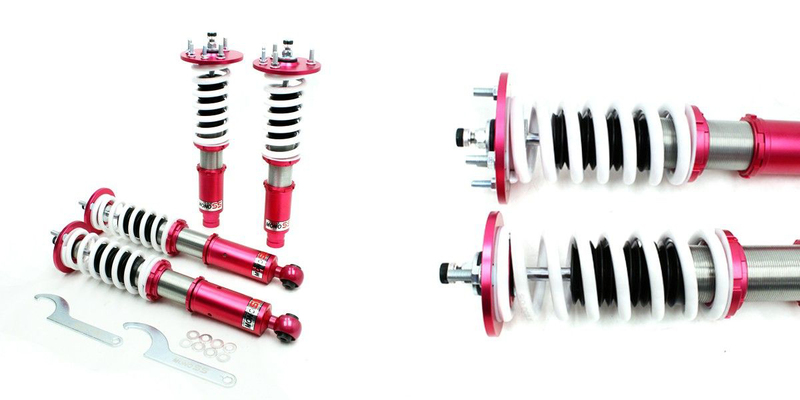 Godspeed Project MAXX coilovers features 33-levels of rebound adjustment. In addition they also feature 24-levels of low speed compression and 50-levels of high speed compression adjustment. In other words the user can fine tune damper function according to the situation race or street. Finally MAXX coilovers feature upgraded Swift springs. This allows the user to maximize full potential of 3-way adjustable dampers. Additional weight external reservoir will balanced out by using light weight yet durable aluminum hardware. The top tier coilovers line offered by Godspeed Project is the Mono-MAX series. Mono Max coilovers sell for an affordable price yet performs on the track. For instance nobody wants a coilover system that can do only one thing. A proper coilover system must be balanced mix of performance and comfort to be used on a street car. Godspeed Mono Max coilovers feature a Mono-Tube shock. The shock body is made out of a carbon seamless steel 52mm tube. The 44mm internal piston provides maximum dampening response. 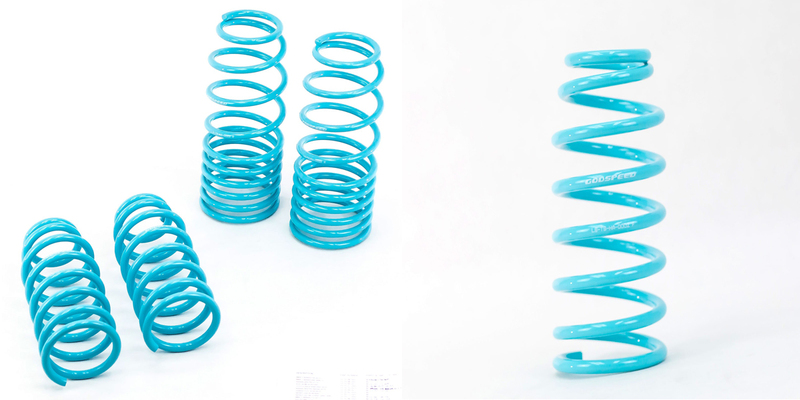 Cold-bent springs made from high strength SAE9252 steel therefore optimize the balance between performance and comfort. In other words the Mono Max Coilovers is a suspension you can live with everyday. Mono max coilovers use a high quality shock oil made in Italy. 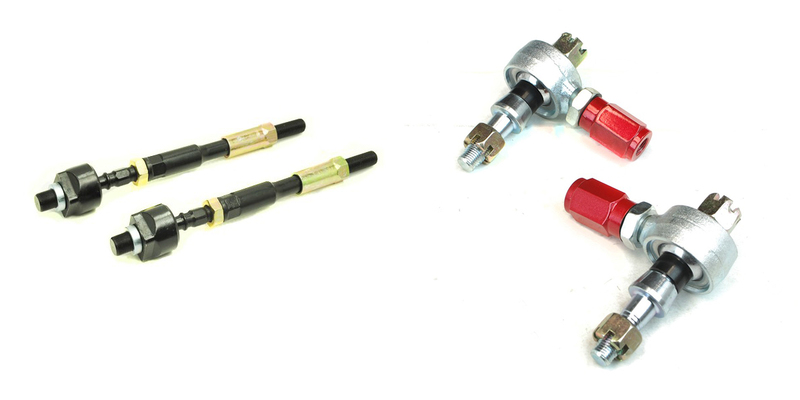 We can guarantee efficient shock absorbing action at any ambient temperature on and off the track. A high quality top hat sits on of the shock body. Godspeed Coilovers feature a high performance bearing pillow ball mount. Above all this provides a very smooth comfortable ride when pushing the limits of your vehicle. 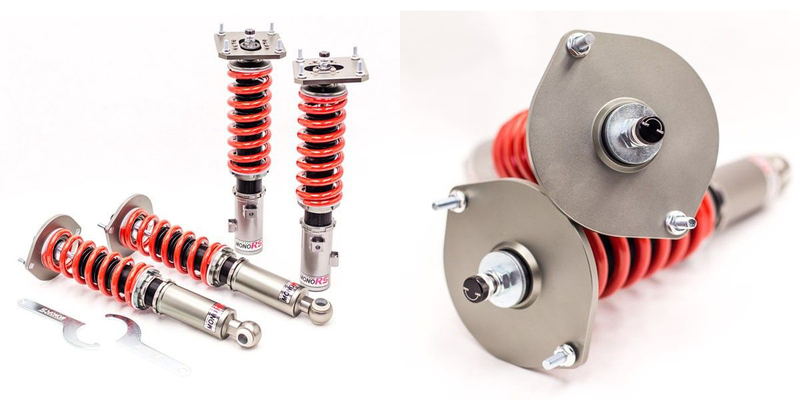 Mono Max coilovers feature lower shock brackets made of forged aluminum alloy. The result is lighter weight without sacrificing durability. Additionally Godspeed coilovers also includes brake line brackets. Godspeed Mono Max coilovers offer 40 level of dampening adjust-ability at the twist of a knob. In conclusion Godspeed Mono Max coilovers are a great value combining both performance and comfort features. Introducing the Godspeed Project Mono-RS coil over line. Mono-RS Coilovers are aimed at customers in the market for a high performance coilover suspension that is also suitable for daily driving. Mono RS coilovers perform exceptionally well in track use. Mono RS Coilovers also provide the comfort that a coilover should when driving on the street. 32 levels of dampening adjust-ability allow you to fine tune the suspension to your liking. Built to perform on the race track and on the street. Godspeed Mono-RS coilovers feature a Mono-Tube shock that houses gas and oil in separate chambers. This results in a coilover suspension that provides consistent shock performance regardless of the abuse it is given. Finally the top hats of the Mono-RS series feature a KOYO Japan built 6204Z bearing. 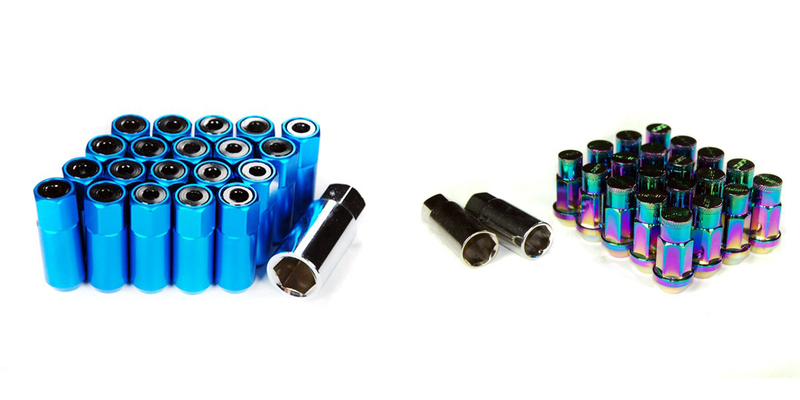 These bearings provide the longevity and performance of a higher end coilover system at a more affordable low price. Introducing the Godspeed Project Mono-SS coilover. The Mono-SS series is a new addition to our Godspeed Project suspension line. Mono SS offers the bare minimum for what we believe an after-market coilover system should be. 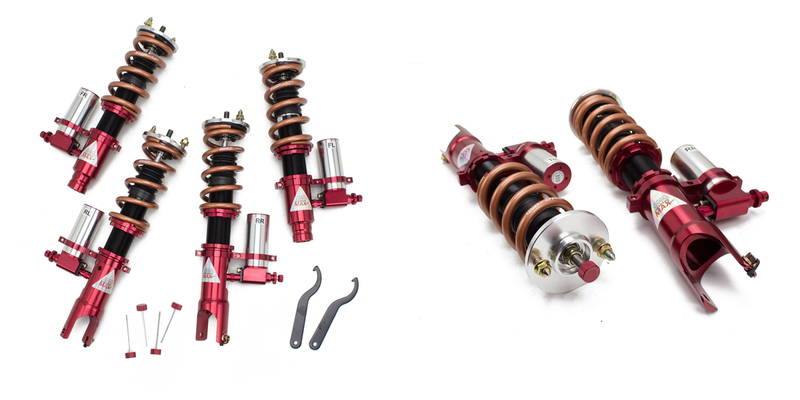 Featuring a Mono-Tube shock, Mono SS coilovers are aimed for consumers who are looking for an economical suspension. 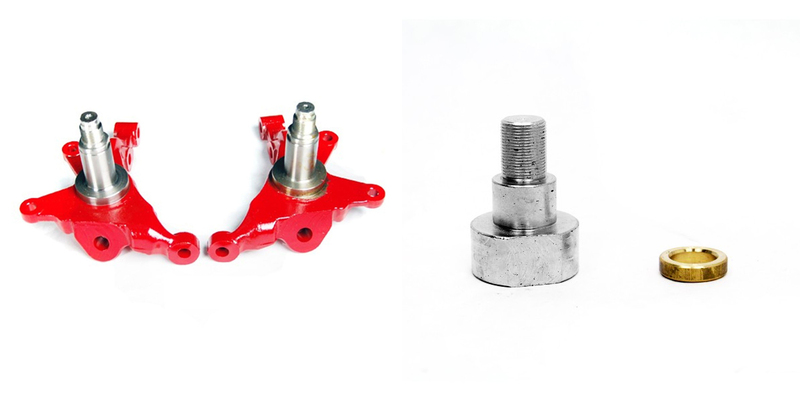 To achieve a comfortable ride the Mono-SS all come with a Poly Urethane bushings. Installed in both the top hat and lower bracket an improved ride is the result instead of a spherical bearing. A spherical bearing can result in a ride too stiff and noisy for some. Godspeed Mono SS Coilovers also cater to consumers who will be driving their cars daily but may hit an occasional track day. The Mono-SS is 16 way adjustable which allows you to fine tune the shock dampening to your liking. Above all the Mono SS series is a great value. Pitch 1.25mm – Nissan, Infiniti & Subaru vehicles. Pitch 1.5mm – Honda / Acura, Toyota / Lexus / Scion, Mitsubishi, Mazda, etc. 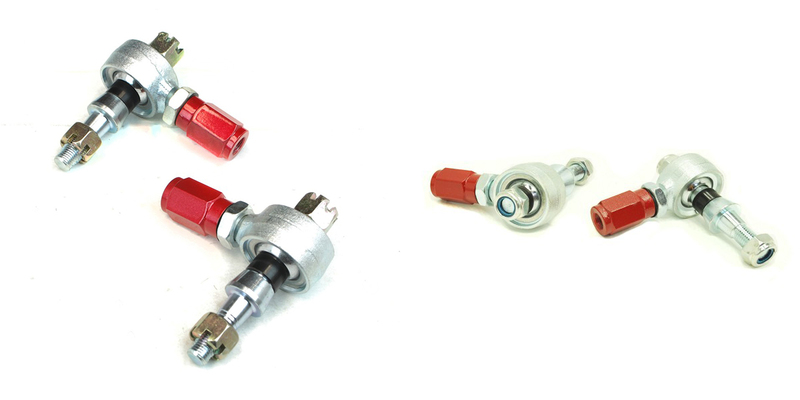 We recommend only using hand tools during installation or removal of the lug nuts. Godspeed Project’s performance lowering springs are cold wound on coil winding machine with SAE 9254 spring wire material, one of the ideal materials available. Manufacturing Process involves steel material going through heat treatments before winding into coils, these are necessary steps in order to deliver an outstanding ultra high tensile strength and provide equal spring rates that are extremely durable in order to resist premature “sagging”. The end result of this process generates a spring that specifically offers improved vehicle handling and response capabilities while maintaining a very smooth yet comfortable ride experience. Godspeed lowering springs offer a noticeable drop to your vehicle ride height while retaining a comfortable clearance for daily driving. Lowering your vehicle will enhance overall appearance. Additionally Godspeed lowering springs will improve vehicle handling significantly.